Bright oranges, deep reds and golds dominate the center shape. It is surrounded by bright yellows, and Prussian blues. The wide red brush strokes could resemble a peacock, the spiritual embodiment of grace, compassion, integrity and the beauty we can exude when we show our true colors. It was created on a very significant day and time: 888, and it was completed in 8 hours and at various stages, I invited chanting, meditation, flute music, drumming and poetry from across the world during a live web-based gathering. 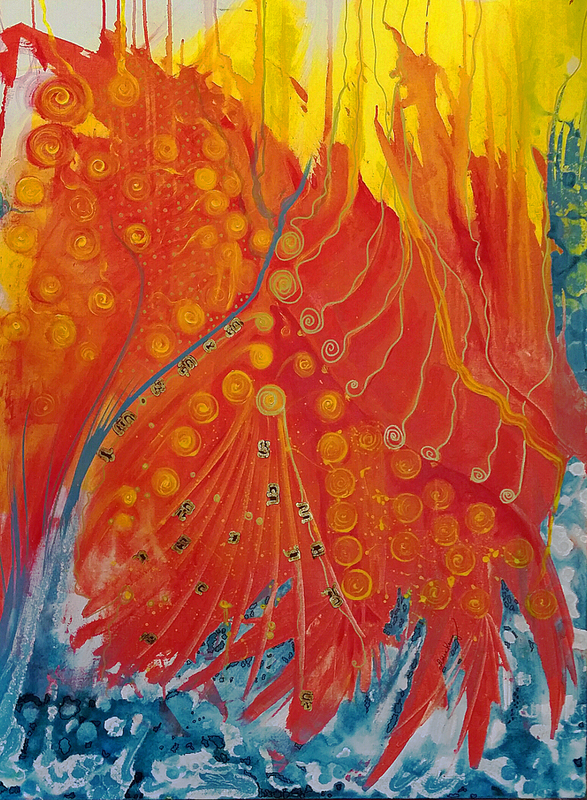 Not surprisingly, there are many symbols of transformation present in this mixed media painting, such as the gold spirals, implying the “eyes” on a peacock’s feathers, mingling with letter-like shapes telling that a higher message is embedded in the fire bird tail as it flies into the sun and reflecting its beauty on the effervescent water below.